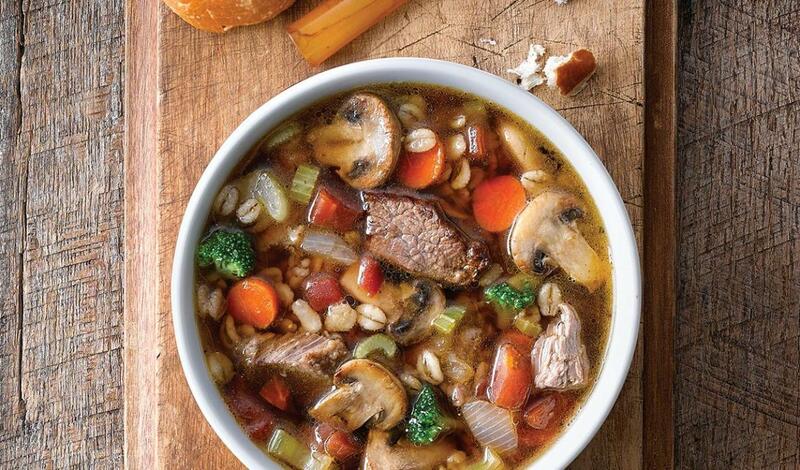 Tender beef mixed with chunky onions, celery and carrots makes for a hearty, warming dish. In a large pot, melt butter. Add beef and cook until browned. Add onions, celery and carrots, sauté until tender. Add mushrooms and cook until liquid is released. Add barley, tomatoes and prepared beef base. Bring to a boil. Simmer for 40 minutes. Add broccoli florets. Simmer until tender. Add seasoning to taste and hold for service. Ladle soup into bowl. Garnish with croutons and/ or parsley, if desired.